CrossRef is an association of scholarly publishers that develops shared infrastructure to support more effective scholarly communications. CrossRef's general purpose is to promote the development and cooperative use of new and innovative technologies to speed and facilitate scholarly research. CrossRef's specific mandate is to be the citation linking backbone for all scholarly information in electronic form. CrossRef is a collaborative reference linking service that functions as a sort of digital switchboard. It holds no full text content, but rather effects linkages through CrossRef Digital Object Identifiers (CrossRef DOI), which are tagged to article metadata supplied by the participating publishers. The end result is an efficient, scalable linking system through which a researcher can click on a reference citation in a journal and access the cited article. CrossRef citation-linking network today covers over 67 million journal articles and other content items (books chapters, data, theses, technical reports) from thousands of scholarly and professional publishers around the globe. Bulletin of NTU "KhPI". Series: Strategic Management, Portfolio, Program and Project Management has been registered by the State Registration Service of Ukraine as a countrywide print mass media. Bielefeld Academic Search Engine (BASE) is one of the world's most voluminous multi-disciplinary search engines especially for academic open access web resources. This engine collects, normalises, and indexes data using the Open Archives Initiative Protocol for Metadata Harvesting (OAI-PMH). BASE provides more than 70 million documents from more than 3,000 sources. Where available, bibliographic data is provided, and the results may be sorted by multiple fields, such as by author, Dewey Decimal Classification or year of publication. Citefactor is a service that provides access to quality controlled Open Access Journals and proceedings. Citefactor is world's largest indexing of scholarly journals & proceedings, which boost the worldwide visibility and accessibility of content. Over 3,000 institutes worldwide have full access to Citefactor. Citefactor users perform million searches every month across the globe. Directory of Open Access Journals (DOAJ) is an online directory that indexes and provides access to high quality, open access, peer-reviewed journals covering all areas of science, technology, medicine, social science and humanities. This directory has index of about 2 million articles from more than 10,000 journals of open-access publishers from 134 countries. The project defines open access journals as scientific and scholarly journals that meet high quality standards by exercising peer review or editorial quality control and use a funding model that does not charge readers or their institutions for access. Directory of Open Access scholarly Resources (ROAD) is a service offered by the ISSN International Centre with the support of the Communication and Information Sector of UNESCO. ROAD provides a free access to a subset of the ISSN Register (1,8 millions of bibliographic records. This subset comprises bibliographic records which describe scholarly resources in Open Access which have been assigned an ISSN by the ISSN Network : journals, conference proceedings and academic repositories. The bibliographic records are enriched, when appropriate, by metadata about the coverage of the resources by indexing, abstracting, citation databases, registries and journal indicators. Google Scholar is a freely accessible web search engine that indexes the full text or metadata of scholarly literature across an array of publishing formats and disciplines. Google Scholar index includes most peer-reviewed online journals of Europe and America's largest scholarly publishers. This product provides the citation indexing features. While Google does not publish the size of Google Scholar's index, third-party researchers estimated it to contain roughly 160 million documents. MIAR - Information Matrix for the Analysis of Journals. MIAR collects data for the identification and the analysis of scientific journals . If you enter an ISSN in the searchbox , the system will check in which databases, those referred to in the matrix, the journal is indexed. The system holds more than 40,000 publications. It was founded in Barcelona (Spain). OpenAIRE (Open Access Infrastructure for Research in Europe) is a project that supports the European Commission Open Access policy by providing an infrastructure for researchers to comply with the European Union Open Access mandate. This repository provides content across academic disciplines with over 11,5 million scientific publications, found in journal articles, dissertations, books, lectures, reports, etc., harvested regularly from more than 610 repositories, from 52 countries. Polska Bibliografia Naukowa (PBN) is a portal of the Polish Ministry of Science and Higher Education, collecting information on publications of Polish scientists and Polish and foreign scholarly journals. The project is co-financed by the European Union under the European Social Fund and is a part of POL-on - The System of Information on Higher Education. This resource indexes more than 560,000 works from 29,676 journals, and also has profiles for 6224 institutions and 27,000 persons. WorldCat is a global union catalog and the world's largest bibliographic database that itemizes the collections of 72,000 libraries in 170 countries that participate in the Online Computer Library Center (OCLC) global cooperative. It contains more than 330 million records, representing over 2 billion physical and digital assets (articles, archival materials, books, journals, maps, music, videos, and other resources) in 485 languages. 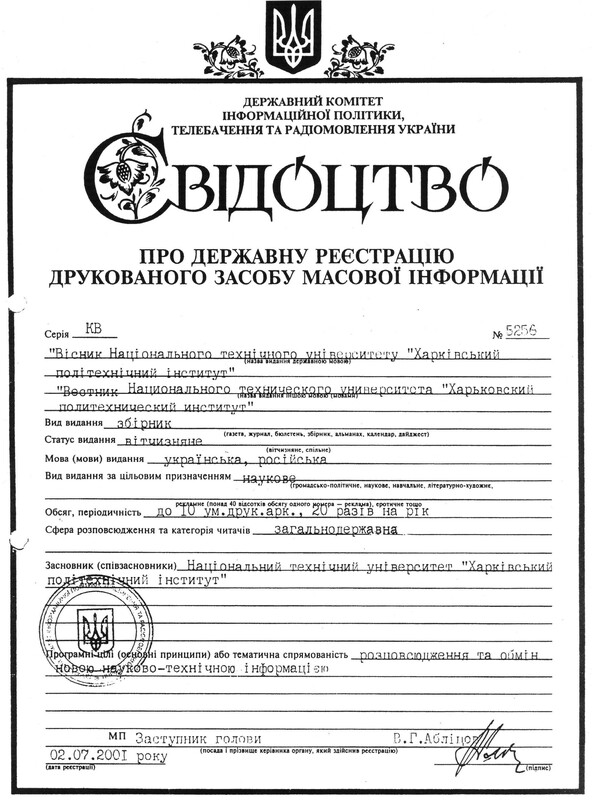 Scientific Periodicals of Ukraine (SPU VNLU) Producer: Vernadsky National Library of Ukraine Scientific Periodicals of Ukraine - project Vernadsky National Library of Ukraine (VNLU). Ukrainian scientific periodicals contain articles from international journals in all fields of knowledge and carries out the completion of full-text electronic information resources, electronic counterparts publications or electronic publications provided by the owners. As part of an information resource "Scientific Periodicals of Ukraine" is adjusted full-text search of scientific publications in PDF format. VNLU spent working on the integration of information resource "Scientific Periodicals of Ukraine" to the interface of analytical services, Google Scholar (Google Academy). It contains approximately 2520 - journals; 25372 - issues; 628524 - full texts of articles.